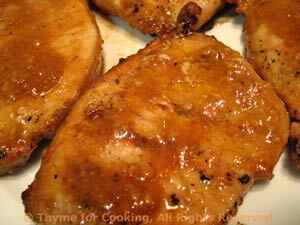 Hot and Sweet Glazed Pork Chops, Thyme for Cooking recipes. We'll be starting to use more ginger as we get into winter cooking. It keeps quite well at room temperature. Fresh, chopped ginger adds a better, sharper flavor than the powdered. Usually you can just break off a small piece at the store. Pour over chops and let marinate for 10 minutes (or longer...). Remove from marinade and cook on barbecue 10 - 15 minutes turning once. Baste with any remaining marinade before turning to give better glaze. In all cases it depends on thickness of the chops. Test for doneness by slicing and peaking. 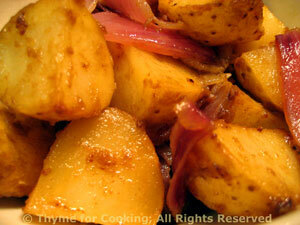 Sweet or red onions add a wonderful flavor to simple grilled potatoes. With the mustard and vinegar this is almost a hot salad... and perfect with simple grilled meats. Slice potatoes - the long way, first in half, then in half again, then in thirds or fourths the short way. (potatoes for roasting). In medium bowl mix vinegar, mustard and oil. Add vegetables and toss to coat. Put them into a grill pan and cook on barbecue (grill) for 20 - 30 minutes or until done... and you will need to stir them with a long-handled wooden spoon occasionally as they tend to develop 'hot spots' and can get a little crispy. Or you can roast them in the oven. Arrange potatoes and onions on baking sheet with rim (I use my trusty, round pizza pan) Bake at 400F for 30 minutes. Nothing like a bit of cheese to top off a veg..... Just sprinkle on at the last minute and cover to melt. Cut zucchini into fourths, the long way, than slice. 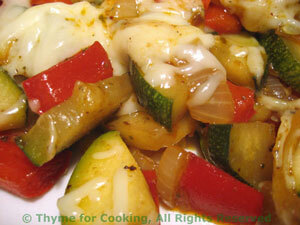 Add zucchini, sauté until zucchini is tender, 5 - 8 minutes longer. Add soy sauce and vinegar, stir to combine. Sprinkle with cheese and cover until cheese melts.